This brooch grew out of my desire to make something with plenty of impact! I had the idea for a starburst design after seeing some wallpaper at a design exhibition, and as I had been recently making lots of sieve-based jewellery, I knew the two could combine to give me the result I wanted. 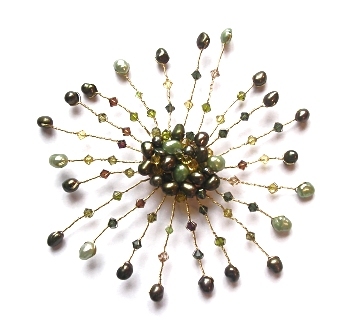 This brooch features as a project in the Fall 2007 issue of Step By Step Wire Jewelry. Instructions are now available to create this piece.